We’re here to help! Your first task is to give your skydiving fears names. That way, you can convert them from vague-but-intense ideas into fully-formed, slayable dragons. Here are our best bits of advice. The world looks like a map when skydiving. Ah, the fear-of-heights thing. So many people give skydiving a miss because of acrophobia. That’s tragic, because – even though it sounds impossible – the fear of heights doesn’t actually matter at all up there. As it turns out, the difference in perspective at exit altitude makes a world of difference. You feel fear of heights when you peek over the edge of a tenth-floor balcony, or check out the world from the railing of a bridge. But have you ever felt the same feeling when you look out the window of an airplane? Probably not. In the absence of the feedback that you get ironically close to the ground, your brain doesn’t have the information it needs to sound the alarm. The world looks like a map. Top fear of skydiving – conquered! We’re not going to patronize you by telling you that everybody dies eventually. That’s a stupid argument that misses the point. Instead, we’re going to talk to you about science. The United States Parachute Association faithfully publishes its statistics year after year, and the numbers are clear. Making a skydive is safer than driving a car. Make no mistake: There are two parachutes in that container, and as a fail safe, there’s even a device installed in the container which will open the reserve parachute even if nobody takes any action to deploy it. That said, skydiving is an extreme sport – which is why you want to do it, n’est-ce pas? It would be ridiculous and untrue to say nothing ever goes wrong. 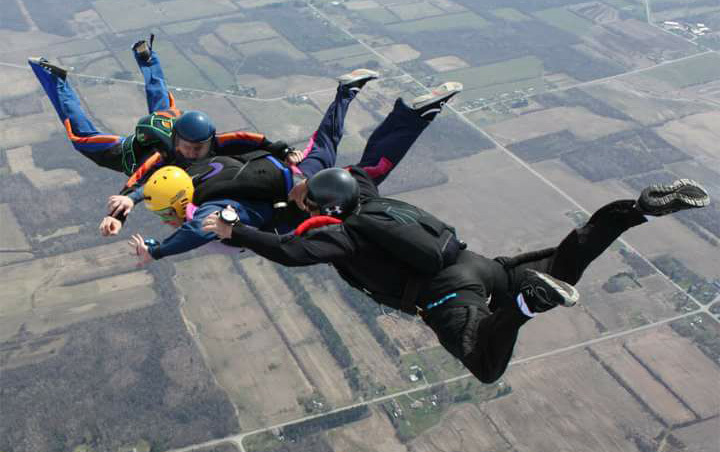 That said, we work tirelessly at WNY Skydiving to keep our perfect safety record a priority. Nothing matters more to us than the safety and well-being of our students and guests. Every choice we make, every day, reflects back on that commitment. 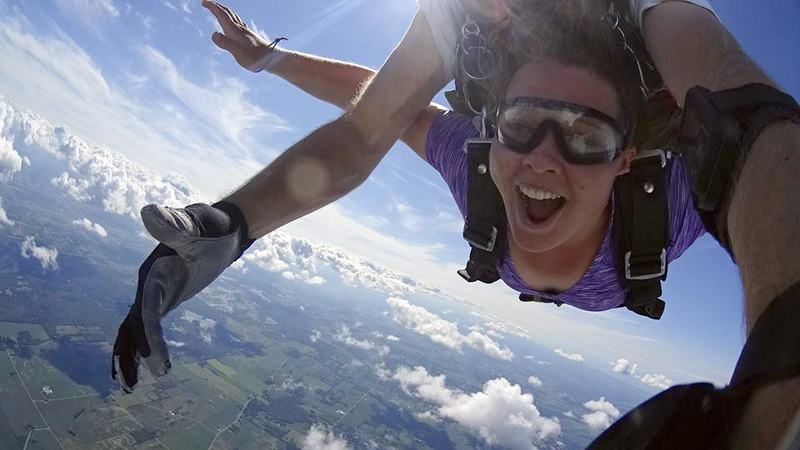 This could be YOU (overcoming your fear of skydiving). Here’s the thing: the other fears are mirages. They may wear several discrete masks, but what all of this comes down to is actually just one thing: Fear of the unknown. From the moment you decide to make a first time skydive, to the moment you step out of your car and walk into the dropzone, to the moment you get out of the plane into the big, blue sky – it’s all unfamiliar, and that’s scary. You’re in a new environment, wearing unfamiliar equipment, listening to unfamiliar (for now) terms, and squaring up to the idea of sending your body into the sensory experience of freefall, for which you have no basis of comparison. We suggest something a little unconventional: Show up to the dropzone before you make a skydive. Get familiar with the operations. Ask about the lingo. Watch lots of landings. Ask questions. Get tips about how to conquer your skydiving fears from the pros. Turn your unfamiliarity into familiarity, so when you’re gearing up yourself, you’ll feel – heck – almost at home! One thing we know for sure: You may have a fear of skydiving – but you are also brave enough to make a skydive. We see people demonstrate that courage every day. Come and show us yours at your first tandem skydive! We can’t wait to meet you.